While the National Voluntary Guidelines (NVGs) on economic, social and environmental responsibilities of business (2011) updated recently cover all aspects required to promote sustainability practices in industries, they are hard to implement and report on in the Indian scenario. 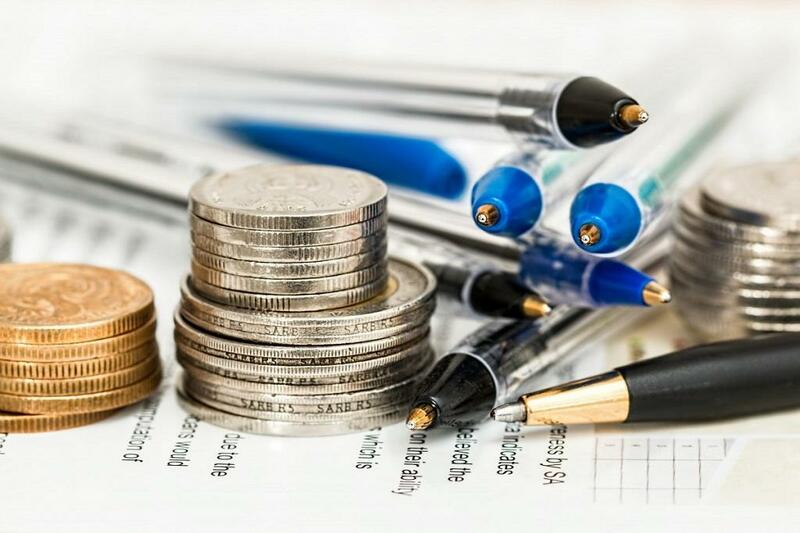 The two-person committee, which was assisted by domain experts appointed by the Indian Institute of Corporate Affairs (IICA), has proposed renaming the guidelines to ‘National Guidelines on Economic, Social and Environmental Responsibilities of Business’. The draft guidelines provide a framework to all businesses, irrespective of their size, sector, location and ownership. An important aspect of the draft document is the chapter on usage of guidelines by the micro, small and medium enterprises (MSMEs). Given the broad nature of the guidelines, it can be argued that relatively, these are good for large companies, especially the top 500 firms by market capitalization since they have all the resources to focus on actualisation of guidelines. On the contrary, smaller companies may find it difficult to implement the guidelines even partially. For MSMEs, cost plays a major role when it comes to compliance of multiple regulations. Concomitantly, generating profits, and more importantly survival are some of the key motivating factors for the sector in general. This is significant since along with agriculture, MSMEs are the backbone of the Indian economy. Even the guidelines reiterate this as MSMEs are the second largest employers after agriculture as it offers around 100 million jobs, “which is 10 times the employment in government and large private sectors put together”. In case of the eventual adoption and execution of the guidelines, the responsibility lies with the “highest governance structure of the business”. It can be argued that this could possibly distort the intent of the guidelines as the onus lies on the “governance structure”, or in other words, the top management to formulate, execute and monitor the policy measures. The framework would require an equal involvement of the management, partners and most importantly, the government agencies for adoption of the guidelines. Quite divergently, the draft guidelines stress on industries to prioritize their core elements, and further integrate these in the core business, for when it should be the government agencies that should communicate and/or strengthen policy measures for integration of the elements. Moreover, the principles also provide a leeway for self compliance to the industries, thus further minimising the involvement of the government. The role of the government therefore seems to have been reduced to mere spectatorship. The success of the guidelines is therefore subject to complete adherence on part of the businesses. There are sufficient indicators showing how companies interpret rules as per their suitability, resulting in gross mismanagement. As is the case with corporate social responsibility (CSR), the Ministry of Corporate Affairs (MoCA) has no real mechanism to regulate improper practices. The arbitrary nature of Schedule VII (areas of spending for CSR initiatives) has witnessed companies spending their allocations recklessly. A classic example of this is the contribution of Rs. 121 crore by India’s four public sector oil companies on the government’s ambitious ‘Statue of Unity’, a gigantic statue of Sardar Vallabhbhai Patel in Gujarat. The draft guidelines provide only generic, apparent and in some cases, conflicting ways of achieving the principles. 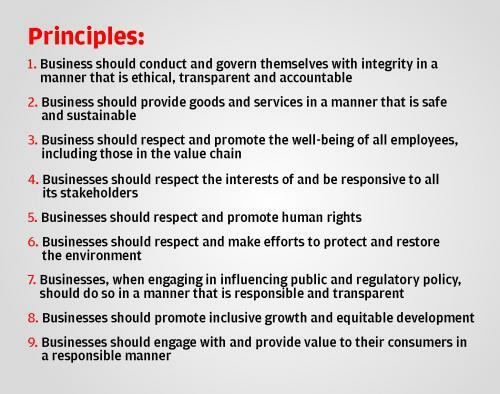 For example, in Principle 3, Core Element 3, the guideline lays down that businesses should “respect” the right to freedom of association, participation of workers, collective bargaining and provide access to appropriate grievance redressal mechanisms, when businesses should be typically encouraging such associations as mandated by law under the Industrial Disputes Act, 1947, Trade Unions Act, 1956 and other. In Principle 9, Core Element 6, it is expected that the businesses advertise and promote their product in a responsible manner, which largely is never the case. Core element 5 of the same principle expects businesses to educate their consumers on safe and responsible usage and disposal of products including reuse and recycling. An action plan for achieving this is absent. Principle 2 talks about provisioning of goods and services in a manner that is safe and sustainable. This will be difficult to implement for some major industries such as mining, pesticide and chemical manufacturing given the nature of the environmental, social / health related impacts these have. The core elements herein should therefore be elaborated and concrete measures should be laid down for compliance. Principle 6 is about restoring environment which is difficult since there exists no law for decommissioning of industries (except for mining in form of financial assurances and bank guarantee). Data and many reports highlight the environmental damages because of high soil and groundwater contamination. As a suggestive measure, in all likelihood, the guidelines will add to the already existing multiple lists of reporting formats. Companies are currently reporting on CSR, BRR, Star Rating of mining companies, environmental statements to State Pollution Control Boards (SPCBs), etc. An inclusive consolidated reporting format could play a vital role in compliance, and also avoid multiplicity of reporting. Since the principles are nothing but mandatory regulatory measures under multiple laws (as given in Annexure E), the consolidated format can further be developed into a legal format and therefore made implementable in nature. These can be further strengthened by a policy level mediation by the MoCA or other relevant ministry/ministries. Involvement of the government is therefore indispensable for the success of such an initiative. The guidelines shall act as an execution tool and not a moral voice to follow. Currently the draft document falls short of proposing concrete measures under the core elements meant for actualization of the principles. This absolves the government of most responsibilities. Instead, reliance on the government to formulate and monitor policy measures for reinforcing the guidelines and the corresponding laws should be as much (or even more) as the expectation from industries to ultimately adopt the principles.